Grab your baskets, it’s Easter egg hunting season! These colorful and elusive prizes are scattered throughout Thurston County – finding them takes a keen eye – but the rewards are great. Everything from candy, toys, cash prizes, and even bikes are waiting to be claimed by eager children. And there are even a couple hunts for those that are kids-at-heart! 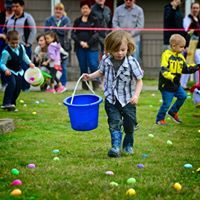 Find plenty of Thurston County Easter eggs hunts and other activities to keep the family busy the entire month of April on this list. Head to the Olympia Timberland Library March 30 and April 1 for a Peeps Scavenger Hunt! Kids can grab a form, find the Peeps book characters hidden throughout the library, draw them on your form, and complete the hunt to claim a prize. Then, starting April 1, kids can use Peeps marshmallow treats to create a scene from one of your favorite books in a diorama. The diorama should be shoe-box sized. You have until April 12 to drop it off at their Youth Services Desk. Then, from April 13-25, return to the library to cast your vote on your favorite Peeps diorama. Local gift certificates will be given to winners in each category. Rules and more information are at the customer service desk. Kids 10 and younger can head to Ralph’s Thriftway to hunt for eggs! This new EasterFest at the Thurston County Fairgrounds is sure to be a fun filled day! Come early and enjoy shopping, food, face painting, activities for kids, raffles and more! Three buildings worth of fun for the whole family. Easter egg hunt starts at 1:00 p.m. for ages 0- to 12-years-old. There will be four age groups and within each age group there will be five golden eggs with special prizes. Event and parking is free, but register for the Easter egg hunt now on Eventbrite. Xtreme Adult Flashlight Egg Hunt is back for its fifth year! Put on at South Sound Church, this is a great time for those that are too old for most of the other Easter activities. There will be a movie with concessions available starting at 6:00 p.m., followed by the egg hunt at dark. Search for eggs over 8 acres of woods, creek swamp, and grass. Big prizes include cash (at least $500 with multiple $100 eggs) big screen TV, $100 gift card to Ricardo’s, two $150 gift cards to El Gaucho, 100 free drink cards for Cutters Point Coffee Co., and the famous “Tables of Awesomeness” that hold random prizes from Peeps, to small appliances, over 200 prizes! 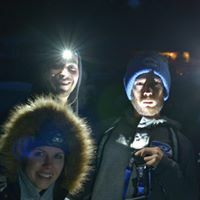 Bring your own flashlight. Proceeds go towards their back to school event and youth ministries. They also have a family egg hunt for free with over 10,000 eggs. Plenty of fun, including an appearance by the Easter Bunny, inflatables and lots of prizes including bikes, baskets, stuffed animals and more. 3 ages groups for ages zero to 6-years-old and up. Hosted by State Farm Insurance Agent Kevin Hayward, the Community Easter Egg Hunt has three hunts at 9:00 a.m., 10:00 a.m. and 11:00 a.m., along with face painting, refreshments and prizes! Each time slot will have four age groups for children up to 12-years-old. Just bring your basket to collect your eggs. Kids 10 and younger can head to Bayview Thriftway to hunt for eggs! 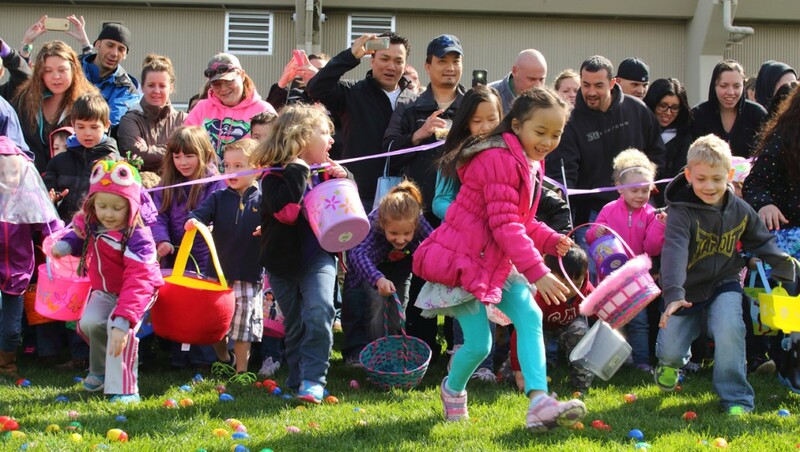 The Yelm Eagles put on a free Easter Egg Hunt every year with four age groups. Every kid will get a prize. They can also get their picture taken with the Easter Bunny. While the event is free, they do accept donations that go towards next year’s hunt. The Olympics West Senior Living Community Easter Egg Hunt is free and open to any child under the age of 10-years-old. They will have plenty of prizes to hand out. 8345 Steilacoom Rd. SE, Lacey. 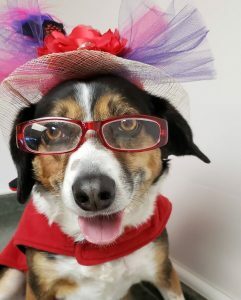 The 12th annual Doggone Easter Egg Hunt, put on by Feline Friends of Olympia, is perfect for those who want their four-legged family member to celebrate with them. It’s a family and pet-friendly day of fun! Activities include egg hunts, a doggie fashion show, games, prizes, bake sale, and much more! Supports Feline Friends and Fences for Fido. Entry is $4 per person, $1 for kids 12 and under. $4 per fashion show entry. Cash or check only. The West Thurston Firefighters Association and Firetones Auxiliary are hosting this year’s Egg Dashes in two locations at two different times, so you can attend one or both! Bring your own camera and snap a pic with the Easter Bunny. Four age groups will be at each location, for children 2- to 12-years-old. Mixx 96.1 and O Bee Credit Union are ready for you to have an egg-cellent time at this year’s O Bee Egg Dash. Bring something to put your eggs in, like a basket, and they have everything else you need! 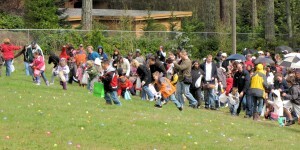 Kids ages 2- to 10-years-old, broken into three groups, can dash for candy and prizes hidden in over 18,000 plastic eggs. Each age group will have one egg with a grand-prize ticket for a new bike and helmet from Falcone’s Bicycle Center. An annual tradition, over 20,000 plastics eggs are waiting children 0- to 10-years-old at the Tumwater Parks & Recreation’s 23rd Annual Easter Egg Dash. Eggs are filled with candy, toys and coupons. Call 360-754-4160 for more information. Kids under 10-years-old are welcome to The Church of Living Water’s EGGSTRAVANGZA. They will have eggs to hunt, as well as photos with the Easter bunny and plenty of candy. The Bush Prairie Homeowners Association has two Easter Egg hunts, starting at 12:00 p.m. for children ages 10-years-old and under. The hunt is located in the Meadow (Arab Drive across from Saddle Court) and will include a light lunch, games and prizes. Then, at dusk, ages 11-years-old and yup will have their chance in the Bowl. A light snack, games and prizes will be provided. Grab your basket and head to one of the many Easter egg hunts sprinkled throughout Thurston County. Alderbrook Resort & Spa is having an Easter brunch complete with a variety of cold and hot plates including antipasti salad, Hood Canal oysters, BLT eggs benedict and stuffed French toast to a carving station, omelets and sweets to finish it all off. Afterward, kids 10-years-old and younger can participate in the Easter egg hunt at 1:00 p.m. Reservations can be made through the FareHarbor website. Head to the Nelson Ranch for an Easter egg hunt on the farm. Check the website for more information at it gets closer to the event. Swantown Inn & Spa invites you to come, meet the Easter Bunny and get your photo taken with him. Donations for the Food Bank gladly accepted. Put on by Olympia FOE #21, this hunt has over 21,000 eggs. It starts a 12:00 p.m. with a special needs, all-ages hunt sponsored by South Sound Parent to Parent, followed by a main hunt at 2:00 p.m. that is broken into age groups. Disabled parking available near the playground.